With clocks set to go back next weekend (hurrah! ), this leaves you with a whole extra hour to indulge in whatever your heart desires. For me, I would very much like to spend those precious 60 minutes trying out new dishes. I tend to seek out cosier eateries when the nights draw in; it is that heady combination of twinkly fairy-lights, candles and warmer indoor temperatures that make me feel so chill, that I am practically horizontal. I recommend visiting Ibérica Manchester to while away those extra, gold-dust minutes (time is precious, don’t you know), and here is why. I visited Ibérica Manchester to review last week. I had just spent the day shopping and I was looking forward to plonking myself down with a large glass of something and just taking stock of life with dining partner S. She is my conscience, rock and reviewing partner in crime in Manchester and visits up north invariably wind up with us putting the world to rights over good food. 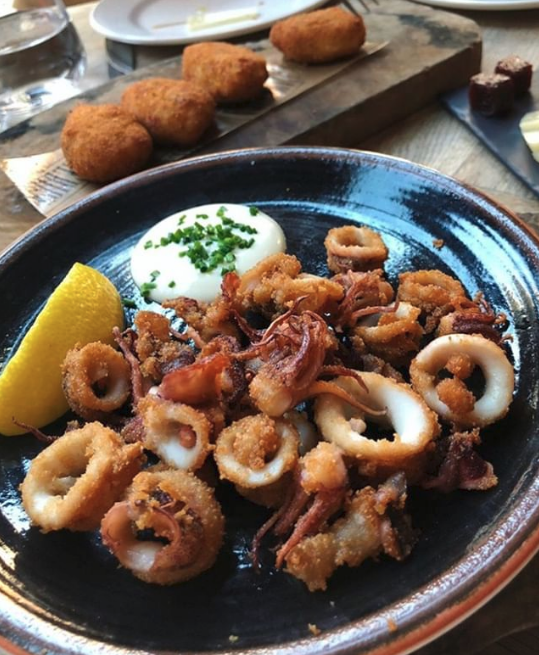 Ibérica Manchester is a tapas bar and restaurant in the heart of Spinningfields. It is welcoming from the outset, warm wood and tobacco tones putting you instantly at ease. If you couldn’t get a seat at London Fashion Week (LFW/19 is exactly 4 months away), bag a seat in the al fresco section downstairs. Here, you can watch the Mancunian world go by. People-watching is my favourite pastime à la Shakespeare, not like some crazed serial killer, whom I imagine would stalk people before the whole planning to kidnap thing. We had a table booking for 6:30pm, and having arrived a little early, settled outside cradling a glass of wine to watch Fendi-flashing fashionistas totter their way into various drinking establishments in Spinningfields. Outdoor heaters and blankets on chairs are a nice touch, especially if like me, you are prone to catching a cold. The downstairs area is the main bar area, where you can perch on high-seated stools should the mood take you. I always find myself to be in a more daring mood whenever I grab a seat on a high chair (more about the psychology of restaurants in a standalone post). As we were eating in, we were shown a table upstairs and placed near the window. You know that whole people-watching pastime I was talking about earlier? Sitting at Table 56 (yes I found that out) ensures the best spot for next-level people-watching. It is because you are elevated and have a bird’s eye view, like I imagine God to have when he’s looking down lamenting orange politicians and the foibles of the wider human race. Table 56 is also located in a cosy corner, and you can peer out of the large floor-to-ceiling windows, for a truly lofty dining experience. Matteo was our server for the evening, whose efficient service and menu knowledge was impressive. 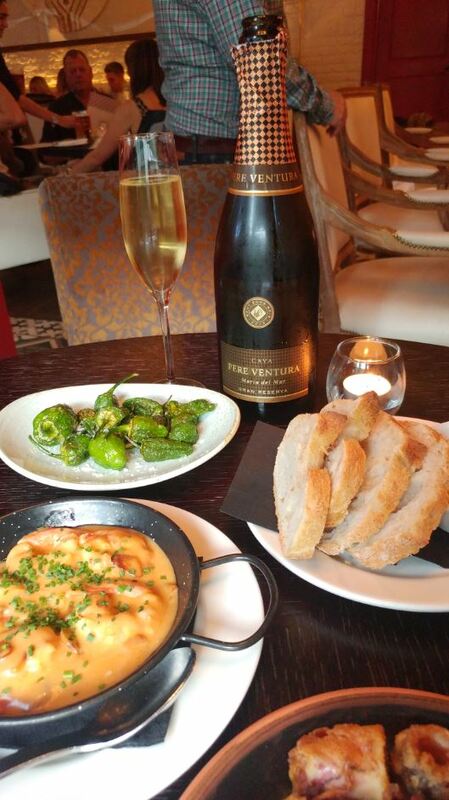 He recommended the Cava Maria del Mar Gran Reserva, whose top notes of roasted nuts and juicy fruit rendered it versatile enough to go with our dining choices. 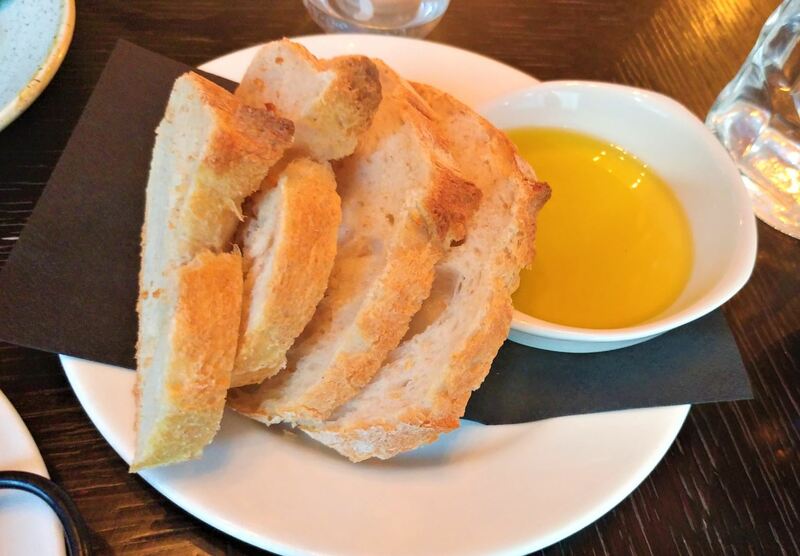 We kicked off with some bread, which was warm, fresh and highly moreish, especially when swiped through golden olive oil. I am having a love affair with Padrones (Galician Padrón peppers, sea salt), and these little beauties did not disappoint. Luscious, chewy and easily one of my favourite things off the menu, I could easily eat Ibérica’s Padrones by the bucketful. Much like munching on Bertie Bott’s Every Flavoured Beans from Harry Potter, you don’t quite know when you’ll get a hot one in your mouth. In my dish here, I came across 4 hot ones (my asbestos mouth loves spicy food), making the dining experience all the more fun. 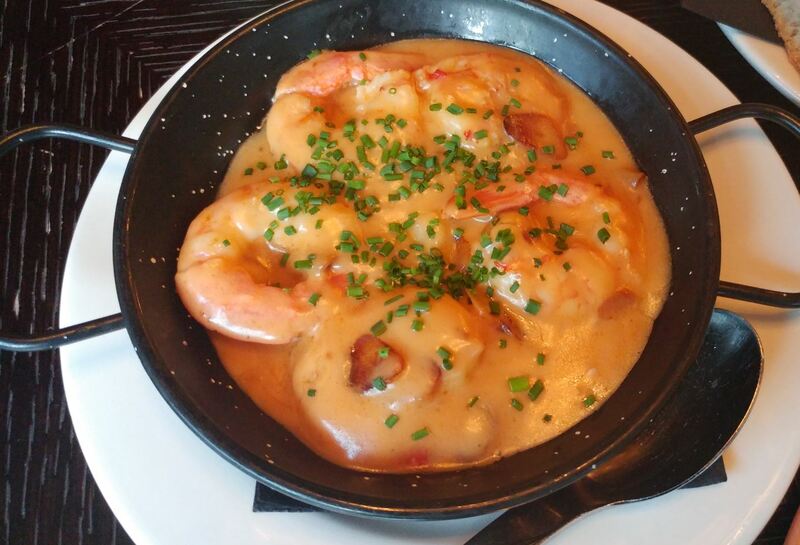 Gambas (prawns, garlic sauce, cayenne pepper) is a dish that surprised me. My usual gambas comprises of prawns tossed in garlic and chilli. Here, the mildly spicy sauce had a creamy base. Cayenne pepper is darker in colour and more piquant, and using Cayenne instead of the usual smoked paprika was a great call. I reserved some of the crusts of my bread and left them to soak in the sauce, which created another tasty dish within a dish. 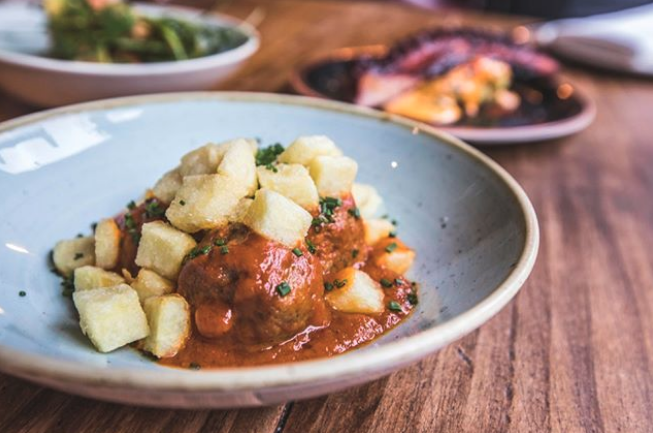 Albóndigas (beef meatballs, fried potatoes, Vizcaína sauce) had a good bite and lovely texture. I tasted pronounced red pepper notes in the sauce which I loved, as I think red pepper is a vastly under-used cooked vegetable. Calamares (fried baby squid, alioli) was one of my favourite dishes. Served steaming hot, the light batter was the perfect partner to fleshy calamari with a lemony tang. The thing about tapas, is that you can taste vast swathes of the menu without getting too stuffed. And because I was comfortably full, I had managed to save some space for dessert. 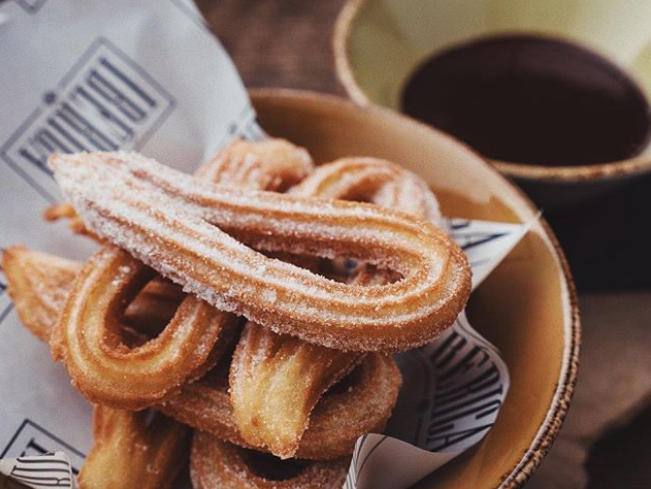 Churros were crisp, light and heavenly dunked into the chocolate dip. I just wish I hadn’t agreed to share dessert (note to future self – don’t be a div and share the sweet stuff). Churros were paired with Licor Café de Orujo, which complemented the dark chocolate sauce dripping from the deep-fried pastry. Ibérica Manchester is the epitome of relaxed dining. The building is pretty, warm, and it feels as if you’re being embraced by an old friend (the best feeling ever). A visit to Ibérica Manchester is highly recommended, so put that extra hour to good use and Usain Bolt it down to Ibérica Manchester now. Quietest table: Table 56 (a large table tucked away in the corner, ideal for having conversation whilst people-watching). Whilst in the area: If your tousled tresses need tending, pop into The Blowout, the UK’s first champagne blowdry bar where you can indulge in a blowdry whilst relaxing with a glass of fizz.